Genuine freshwater pearl strands, potato shape pearl, 16" length, various sizes, colors, quality are available. When you have a particular pearl or pearl color in mind, browsing by Pearl Type is the perfect way to narrow down the field. Hashmiasia offers jewelry with several types of cultured pearls; Tahitian Pearls (also known as "Black" pearls), South Sea Pearls, Freshwater Pearls and Akoya Pearls. Tahitian pearls are known for their amazing colors and interesting shapes. Tahitian pearls come in marvelous shades of green, blue and bronze as well as black and shades of grey. Often nature blends these colors together to spectactuar results with overtones of purple, green and blue. Tahitian pearls also come in an array of shapes further adding to their exotic nature. South Sea pearls are perhaps the most highly valued of all cultured pearls. 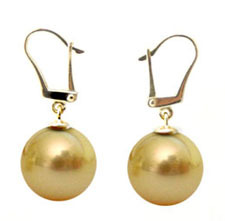 South Sea pearls are appreciated for their often large size and dazzling golden or silver-white colors. Freshwater pearls offer excellent value with amazingly low prices for the quality they offer. 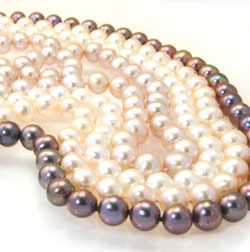 Freshwater pearls come naturally colored in white, ivory, peach, pink, lavender and burgundy. Akoya pearls are especially famous for their brilliant luster. White Akoya pearls, grown in the cooler waters of Northern latitudes, have a spectacularly high-quality nacre coating. The value of the pearls is determined by a combination of the luster, colour, size, lack of surface flaw and symmetry. Natural pearls are very rare jewels, thus very much costly. The valuation factors include size, shape, surface quality, orientation, and luster. Luster is the most important factor of pearl quality. Pearls come in different shapes. They can be round, semi-round, button, drop, pear, oval, baroque, and circled. Perfectly round pearls are the rarest and most valuable shape. Semi-rounds and button pearls are used in necklaces. Popular use of button pearls is in single pendants or earrings. Drop and pear shaped pearls are referred as teardrop pearls and are used in earrings, pendants, or as a center pearl in necklaces.